OK Jazz fans, I have something for you, too. This book and disk has something for any lover of jazz, from Tin Pan alley to modern jazz. For my fifth fake book, I chose the chord progressions to The Ultimate Jazz Fake Book. The songs in this book represent the many styles of music that make up the beloved idiom we call jazz. The styles found in this collection include: Traditional, Swing, Bebop, Latin/Bossa Nova, Hard Bop/Modern Jazz, Straight Ahead, and Tin Pan Alley Standards/Show Tunes. This book contains over 625 songs that are important to every jazz library. The chords are carefully chosen with common practice chord substitutions. In most cases you will find the chord changes to be contemporary but not outside. 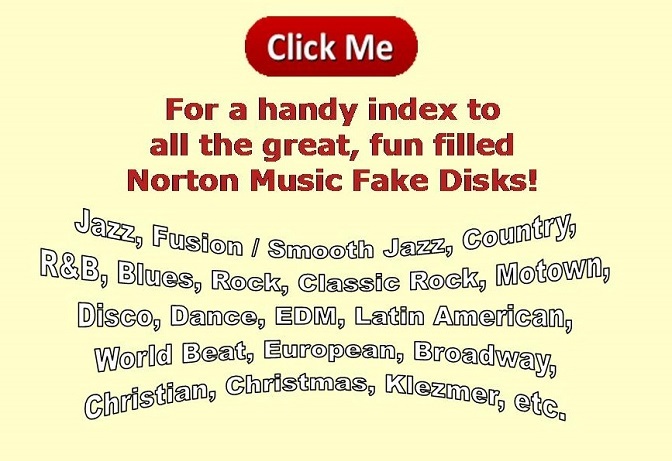 Norton Music's Fake Disk #5 contains all the chord progressions in The Ultimate Jazz Fake Book exactly as they appear in the book. This book reads like a Who's Who of jazz. Included are songs recorded by Cannonball Adderly � Louis Armstrong � Count Basie � Clifford Brown � Dave Brubeck � Nat King Cole � John Coltrane � Miles Davis � Herb Ellis � Bill Evans � Gil Evans � Ella Fitzgerald � Errol Garner � Stan Getz � Benny Goodman � Dexter Gordon � Coleman Hawkins � Woody Herman � Billy Holiday � Stan Kenton � Peggy Lee � Carmen McRae � Thelonious Monk � Wes Montgomery � Gerry Mulligan � Anita O'Day � Charlie Parker � Oscar Peterson � Woody Shaw � George Shearing � Horace Silver � Sonny Stitt � Jack Teagarden � Mel Torme � Sara Vaugn � Ben Webster � Phil Woods � Lester Young � and many more. There are no song duplications in this disk and disk #17. Over 1,000 great jazz songs in all!!! • Have You Met Miss Jones? • Let It Snow! Let It Snow! Let It Snow! • What Kind Of Fool Am I? • Why Do I Love You?